What distinguishes these articles is that all of them were later reprinted in a yearlong series in METHODIST MAGAZINE, which is where I have chosen to place my annotations. SUNDAY AT HOME AND OVERSEA prints its title with SUNDAY AT HOME in much larger letters than AND OVERSEA, and eventually those two words were dropped, so the full title is not always used. The same is true of EVERYBODY'S WEEKLY, where the word WEEKLY is hardly visible at all. The order is chronological. A Gentle Biographer. London: THE SUNDAY AT HOME, Office, 4, Bouverie Street, London, E.C.4. May 1939, pp 496-497. Rebound into an annual, The Sunday at Home : 1938-39, by United Society for Christian Literature, same address, same page numbers. This is the original article that was slightly edited and reprinted as I Must Read them Again: Izaak Walton's 'Lives' in METHODIST MAGAZINE. In 1939 Savery regretted that Walton did not write Lives of Michael Drayton, Thomas Traherne, or Jeremy Taylor rather than fishing. The 1954 reprint retains the regret, but excises the names. Other changes are even smaller. I detect an editor's hand rather than the author's. Knowing she was writing about Izaak Walton, Savery does not trouble to mention his name until she has described him in considerable detail. Agneta Thomson noticed this and mentioned it to me. A Peep behind the Scenes was also on a list furnished Savery by the publisher. The title was one of four Awful Examples defended by Savery in an article in THE CHRISTIAN GRADUATE, In Defense of 'All That' (1963). certain conspicuous qualities dear to the child mind: sincerity, simplicity, friendliness, tidiness. Her prose, Savery confesses, was pedestrian, but that was irrelevant. There was truth in every line, and Savery recalls how the story carried her along to magical places, including the forbidden theatre, and introduced her to likeable people. Savery also appreciated the tidiness that led Walton to wind up every loose string, so that we even know the future of a black kitten. Every generation, Savery assures us, should take "its peep behind the scenes." Savery's submission of this article prompted the publisher to ask for more. It was reprinted by METHODIST MAGAZINE in 1954 as I Must Read them Again: 'The Wide, Wide World'. The annotation is there. Along with five others, this book was chosen from a publisher's list for discussion. In 1954 the article was reprinted as I Must Read them Again: 'Uncle Tom's Cabin' in METHODIST MAGAZINE. This article was reprinted in 1954 as I Must Read them Again: Piper of the Sea in METHODIST MAGAZINE. Like most of the other articles for THE SUNDAY AT HOME, it was chosen from a publisher's list. The notation '#3 of Series' is from the work diary, and it isn't clear what series is referenced, since it is fourth in the series for THE SUNDAY AT HOME. Savery makes Piper of the Sea sound like a magical book that must be read, but it is sufficiently expensive that I haven't done so. 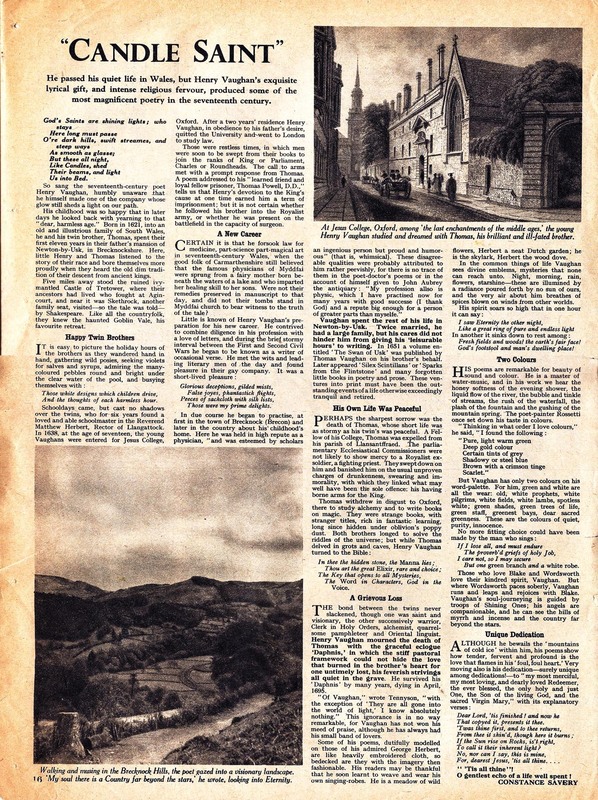 The article was reprinted with the same title by METHODIST MAGAZINE in May 1954. When the publisher gave Savery a list of eleven authors or books on their list to consider for a series of articles, she also included Pilgrim's Progress. METHODIST MAGAZINE reprinted the review in 1954 as I Must Read them Again: 'The Pilgrim's Progress'. I have annotated it there. Yet another of the titles chosen by Savery, see above, this article was reprinted as I Must Read them Again: The School Stories of Talbot Baines Reed in METHODIST MAGAZINE, 1954. "Candle Saint". London: EVERYBODY'S WEEKLY, Everybody's Publications, Ltd., 114 Fleet Street, London E.C.4. Apr. 11, 1949?? Printed by Sun Printers, Ltd., London and Watford, Herts. The date above, taken from the work diary, is incorrect. No issue was printed on April 11, and the Savery article is not in the one for April 9. I have not yet located the magazine, but I have a copy of the article (right), which is very similar to The Candle-Saint: Henry Vaughan, in the 1954 METHODIST MAGAZINE. Having perused contents lists of other issues of EVERYBODY'S from 1949 through 1952, I believe that A Lady of Flowers and Friendship, below, is the only other article from METHODIST MAGAZINE originally printed in EVERYBODY'S. A Lady of Flowers and Friendship. London: EVERYBODY'S WEEKLY, Everybody's Publications, Ltd., 114 Fleet Street, London E.C.4. Nov. 11, 1950, pp 18, 28. Printed by Sun Printers, Ltd., London and Watford, Herts. Like The Candle-Saint above, this article was the source for an edited version without illustrations published later in METHODIST MAGAZINE: Dearest Mrs. Delany: Her Letters and Memoirs. EVERYBODY'S is a very large magazine, and only the top of the cover is shown in the illustration since neither Savery nor her article is mentioned there. Reprinted, 1956, as The Attic Bookshelf: Some Small Pink Books in METHODIST MAGAZINE, where there is a longer annotation. This is another instance in which the newspaper is too large for the whole page to be reproduced. Text of this web site © 2010-2013 by Eric Schonblom. The unpublished works of Constance Savery are reproduced with the permission of her copyright owner, J. D. Hummerstone. Book and magazine covers are reproduced with low resolution out of respect for their copyright owners, the publishers and their artists. Updated 9 February 2013.